Many marinas are deteriorating due to lack of maintenance. Notice that your zincs are melting away? Last December I had my boat hauled out, and put on all new zincs. My diver reported in April that several of my zincs already needed replacement. Also, my new bottom paint was disappearing in many places!! He found strong electrolysis in the water. I reported it to the harbormaster, who of course, did nothing. It can also be caused by boats using automotive chargers. Some electric dehumidifiers cause some electrolysis! 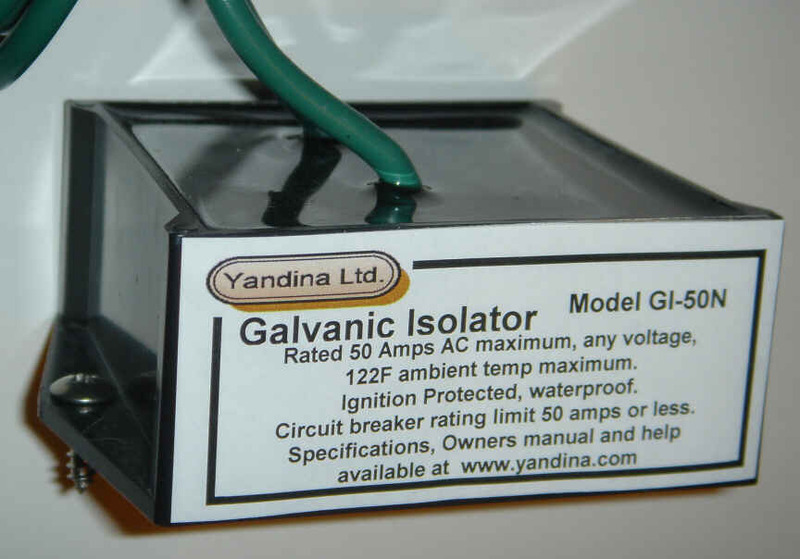 Your best protection is a galvanic isolator. They are easy to install, and will save your zincs, propellers, rudders, etc etc. West Marine sells 2 kinds, one for 30 amp systems at $300 plus tax, and one for 50-60amp systems for $400 plus tax. I managed to buy a new galvanic isolator, VOLTAGE RATING 115/230 , AMPS 50-60hZ. built by GUEST, for $300.00. Tax included. When a friend of mine, tries to install it, he found there was already one there, but the wire had come loose. After he reattached it, my electrolysis problems were over. I have kept the isolator, and if you need one, please email me at f.Schreuder@sbcglobal.net, and I will sell it to you for $300 net.